Bagan is best viewed at sunset. BAGAN Bagan, famous for the 5,000 pagodas built there in the 11th and 12th centuries, was a thriving area until it was sacked by Kubla Khan. 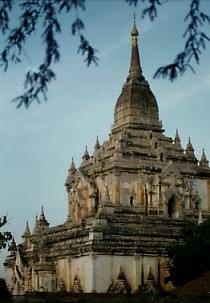 Most pagodas were small shrines but several were large temples (or small pyramids). I bicycled all over Bagan (something possible to do in December -- not July). I visited the temples, but I did my share of tourist shops, too. Bagan is known for lacquerware -- trays, cups, vases, jewelry. The interior base is woven bamboo or wood. It is lacquered, sanded, and repeated around twenty times until the end product is smooth and then intricately hand etched. I wasn't impressed with the final product until I saw how it was made. Then I had to have some, LOTS! The prices were sinfully cheap but I could do better than that. In Burma, you can trade for everything! I bought one vase for five dollars and a backpack. I "bought" a huge water jug with my watch and fifteen dollars. I also traded away my T - shirts for other treasures. I would have traded more if I only had it. Wayne Rutherford was sure I was going to trade away the only pair of pants I brought with me. I was tempted. 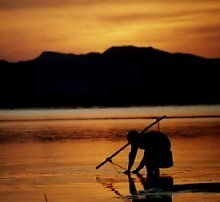 In Burma most men wore wrap around skirts called longyis. There had been a lot of restoration work since my first visit. The summer months were too hot to walk so I took a horse cart. 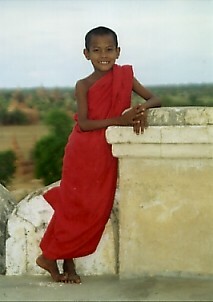 The last time in Bagan, I met a charming boy at sunset on a pagoda. Aung Kyaw Myink even took me to his house. Well, I had to look him up. A lot happens between age 11 and 15. Aung Aung was huge -- but very gentle and polite. He instantly remembered me. When I visited before, the family was shy. This time I was invited back for supper. Maw Nu Nu, the mother, greeted me warmly and had gifts. (I was relieved I had presents for Aung Aung!) I left for the hotel around 9:00 P.M., but Aung Aung and his mother promised to see me off in the morning. Sure enough, friends awaited at 6:00 A.M. to see me to the airport. Copyright 1998 by Phillip Martin All rights reserved.